Starting off with a slow almost bluesy intro Dig Your Grave then kicks into just about the best damn metal track you'll hear in a long time. Powerfull and anthemic with amazing guitar work that out does that cold lifeless Dragonforce stuff anyday, Mick plays with a real passion and that comes over on disc just as it did when he played live with Nothin To Lose. Track two is more of the same and catchy as hell with great vocals, reminding me of wednesday 13, but then how can you go wrong when you have been working hard on something for so long and enlist Adrian to play drums for you????? The last track is an instrumental which gives Mick another chance to show that he is one of this countrys best guitarists (Herman who??) but with soul. Gigs, video and much more is lined up for 2009, you need to watch out for this. 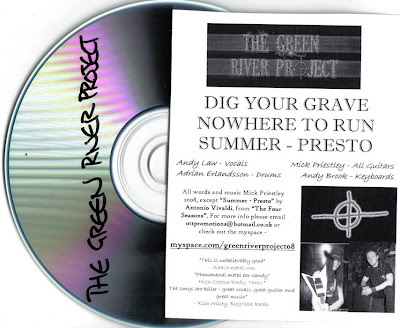 To be honest the only thing i dont like about this is the name 'Green River Project' as it gives the impression its some kind of tribute to the pre Pearl Jam/Mudhoney grunge band, though i suspect that Mick may have gone for the serial killer connection, its still confusing and when it comes to promoting the band could cause problems.